Advisory Board Named by the Acting President, Mrs. H. W. Coe. The new headquarters of the Oregon State Equal Suffrage association at 516 Selling building present a comfortable but businesslike aspect. Visitors are impressed with the fact that an earnest campaign is under way and will be extended from those offices throughout the state. 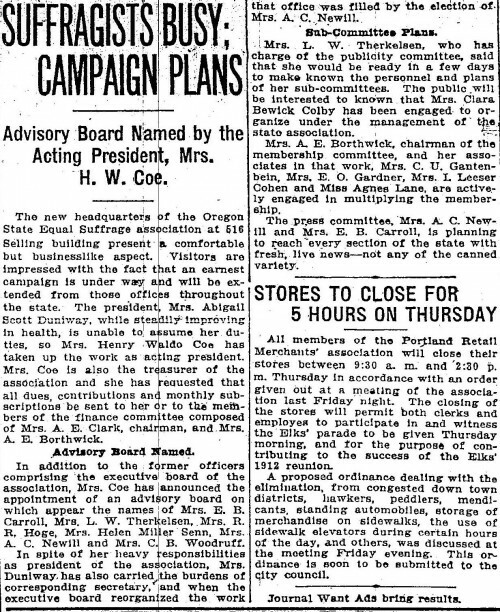 The president, Mrs. Abigail Scott Duniway, while steadily improving in health, is unable to assume her duties, so Mrs. Henry Waldo Coe has taken up the work as acting president. Mrs. Coe is also the treasurer of the association and she has requested that all dues, contributions and monthly subscriptions be sent to her or to the members of the finance committee composed of Mrs. A. E. Clark, chairman, and Mrs. A. E. Borthwick. In addition to the former officers comprising the executive board of the association, Mrs. Coe has announced the appointment of an advisory board on which appear the names of Mrs. E. B. Carroll, Mrs. L. W. Therkelsen, Mrs. R. R. Hoge, Mrs. Helen Miller Senn, Mrs. A. C. Newill and Mrs. C. B. Woodruff. In spite of her heavy responsibilities as president of the association, Mrs. Duniway has also carried the burdens of corresponding secretary, and when the executive board reorganized the work that office was filled by the election of Mrs. A. C. Newill. Mrs. L. W. Therkelsen, who has charge of the publicity committee, said that she would be ready in a few days to make known the personnel and plans of her sub-committees. The public will be interested to known that Mrs. Clara Bewick Colby has been engaged to organize under the management of the state association. Mrs. A. E. Borthwick, chairman of the membership committee, and her associates in that work, Mrs. C. U. Gantenbein, Mrs. E. O. Gardner, Mrs. L. Leeser Cohen and Miss Agnes Lane, are actively engaged in multiplying the membership. 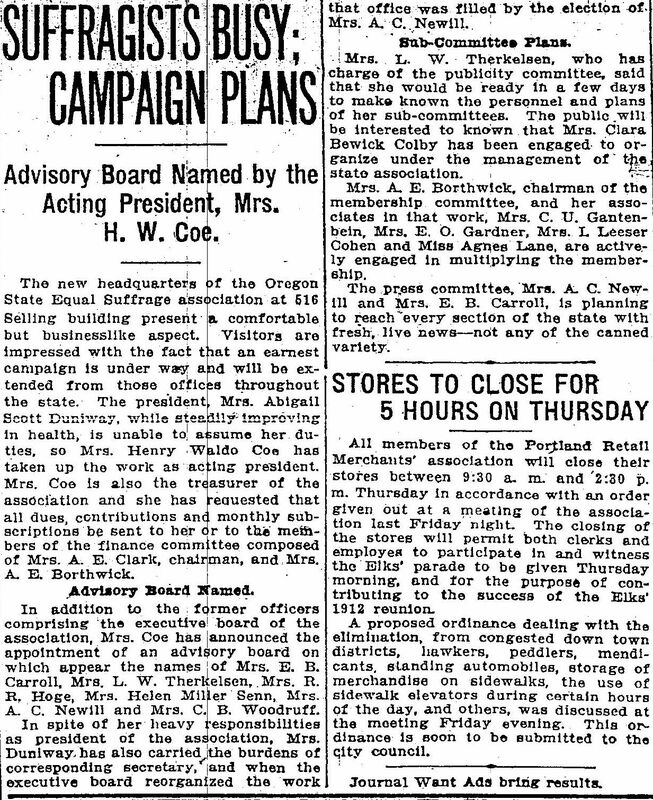 The press committee, Mrs. A. C. Newill and Mrs. E. B. Carroll, is planning to reach every section of the state with fresh, live news—not any of the canned variety.